The Alsea Watershed Study is part of the Watershed Research Cooperative at Oregon State University and receives in-kind and financial support from Plum Creek Timber Company and the National Council for Air and Stream Improvement, Inc. The Alsea Watersheds provide an opportunity to compare water resource responses to current forest practices with those resulting from an extreme manipulation in the 1960s. 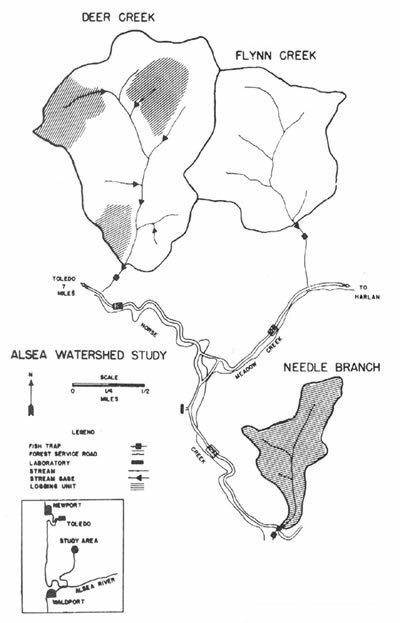 The original Alsea Watershed Study assessed the effect of timber harvesting on water, aquatic habitat, and salmonid resources using a paired-watershed approach. Flynn Creek was an undisturbed control watershed in the original study and remains an undisturbed Natural Research Area under management by the USDA Forest Service. Deer Creek was partially cut and demonstrated the effectiveness of streamside management zones. Needle Branch was impacted by nearly complete clearcut timber harvesting and subsequent slash burning, with no streamside vegetative buffer. It experienced dramatic water quality responses for temperature and dissolved oxygen. Changes in discharge, sediment, and nutrients were also noted, although these were somewhat more subtle, if more prolonged. The water quality impacts observed for Needle Branch are sometimes erroneously cited as the inevitable consequence of clearcutting.